Masala pasta recipe (Indian Style Pasta) | Cook Click N Devour!!! Masala pasta recipe is an easy and quick easy Indian style pasta made with out any ready made sauces or cheese. Indian masala pasta is made with loads of vegetables and Indian spices. This pasta gets ready in 20 minutes and makes for a excellent snack or a good weekend brunch especially for kids. Masala pasta is our recent favorite at home that I make at times for dinner or weekend brunch. This Indian style pasta especially is an wonderful dish to pack in kids lunchbox. This masala pasta is spicier and tangier as opposite to traditional pasta recipes and therefore much suited to Indian palate. If you are looking for easy pasta recipes with familiar flavor then do try this Indian style pasta recipe. You can make masala pasta in many ways. You can vary the seasoning and spices and just easily create new flavors every time. Variations with masala pasta recipe. You can use any pulao base like paneer butter or palak paneer pulao and make this pasta. Just use al dente pasta and toss instead of rice. You can add a handful of cubed paneer or tofu in masala pasta. Adding paneer is especially a great way to increase protein if you are serving this as main meal. Sometimes I also add boiled chickpeas in this recipe. When making masala pasta for kids you can skip chili powder and add pepper powder also. You can add any of your favorite vegetables in masala pasta. 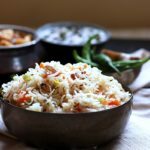 Typically veggies used in pulao suits best in this recipe also. I prefer to use carrot, bell peppers, baby corn, onions, green peas in this recipe. I use organic durum wheat pasta or whole wheat pasta in my pasta recipes, Our recent favorite is organic durum wheat pasta from down to earth. You can use penne, macaroni or fusili pasta in this recipe. Serve masala pasta with thick yogurt to bring down the spice level especially for kids. This pasta tastes well on its won too. Let the pasta cool a bit before packing in lunch box. white sauce pasta, penne arrabbiata, roasted bell pepper pasta, red sauce pasta. 2. Drain the cooked pasta and rinse with cold water.Set aside. 3. Heat 2-3 teaspoons oil in a kadai. Once hot temper with mustard seeds. Add cumin,green chilies,ginger and curry leaves. Saute well. 4. Add chopped onions and saute till translucent.Add the tomatoes and saute till mushy.Add the bell peppers,salt,garam masala,turmeric powder and saute for 6-7 minutes. 5. Add the cooked pasta and toss gently.Saute in low flame for 2-3 minutes and remove from flame. 6. Serve Indian style masala pasta hot. It tastes good in lunch box too. Indian stye masala pasta recipe- a very delicious way to prepare pasta with veggies and Indian spices,makes a healthy and filling snack/dinner. Drain the cooked pasta and rinse with cold water.Set aside. Heat 2-3 teaspoons oil in a kadai.Once hot temper with mustard,cumin,green chillies,ginger and curry leaves. Add chopped onions and saute till translucent.Add the tomatoes and saute till mushy.Add the bell peppers,salt,garam masala,turmeric powder and saute for 6-7 minutes. Add the cooked pasta and toss gently.Saute in low flame for 2-3 minutes and remove from flame. Serve Indian style masala pasta hot/it tastes good in lunch box too. 1.You can add as many veggies along with bell pepper,they add to taste and nutrition.I was in short of veggies actually. 2.You can add any masala like pav bhaji masala.garam masala etc to give a twist. 3. Adding oil while cooking pasta is to avoid sticking and breaking of pasta. pasta looks yummy …love it .. Loved the twist to this pasta!! Looks yummy!! ‘Indian’ised pasta.. Looks yummy and very inviting..